NCAA Stunner: South Carolina Boots Duke From Tournament : The Two-Way Second-seed Duke was knocked out of the men's NCAA basketball tournament on Sunday by No. 7 seed South Carolina, 88-81. 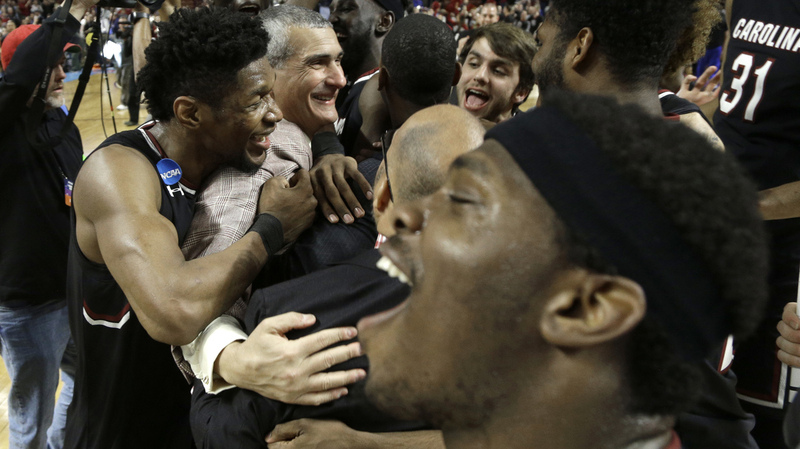 South Carolina head coach Frank Martin, second from left, is hugged by Chris Silva, left, as they celebrate after a second-round game against Duke in the NCAA men's college basketball tournament in Greenville, S.C., on Sunday. The game was played in Greenville, S.C., effectively giving the South Carolina Gamecocks home-court advantage. After the game, Duke head coach Mike Krzyzewski said South Carolina's physical nature wore down his team in the second half. "That's the most physical team we've faced all year," he said. The Gamecocks trailed by 10 points early in the second half before launching a comeback led by Chris Silva, who scored 13 of his 17 points after intermission. "I told the guys at halftime, someone's got to have the courage and make shots," South Carolina coach Frank Martin said. "Hats off to Frank Martin for getting the Gamecocks to a place they haven't been to in 44 years. Duke losing is the bigger story, but Martin accomplishing that for that program is the better story. Winning in basketball isn't common at South Carolina, and now Martin will forever be remembered at that program. "Still, the game's location and the reasons for the tournament being played at said location must be addressed. Almost no one is going to be feeling sorry for Duke losing, but we have to have a realistic discussion here. "Duke, a 2 seed, in effect played a road game in the NCAA Tournament. South Carolina fans, as they should have, overtook the building. Tar Heels fans, as they should have, filled up the joint and joined in their border buddies to cheer against Duke. But this was a bracket oddity. The selection committee could have opted to put South Carolina as a 7 in the Midwest and Michigan as a 7 in the East, flipping the teams, and the disadvantage would've been eliminated. "The reason for the unprecedented quasi-home court for a lower-seeded team in a second round game was born from an unprecedented decision. This game was held in Greenville, South Carolina, only because of a man named Pat McCrory. He's the now-voted-out governor from North Carolina who put into law a bill that the NCAA protested by means of moving the 2017 tourney out of Greensboro, North Carolina." South Carolina next takes on No. 3 seed Baylor in the East Regional at Madison Square Garden in New York City. In an upset Saturday night, No. 8 Wisconsin beat top seed and defending champion Villanova, 65-62. On Sunday, top seed North Carolina's standing in the tournament was challenged. The Tar Heels saw a 17-point lead become a 65-60 deficit before they rallied in the final minutes to beat Arkansas, 72-65. Kansas moves on to the next round after the Jayhawks beat Michigan State on Sunday, 90-70. No. 1 Gonzaga stayed alive in the NCAA Tournament Saturday night by holding off Northwestern.